Ronnie Watt (left) as depicted by celebrated Aberdeen painter, Eric Auld. Aberdeen’s famous Karate man Ronnie Watt (9th Dan) will be flying off to Japan on Frday (Oct 7) at the invitation of the Japanese through a fellow martial artist. A Kendo instructor from Japan, Kazuo Yamazaki, who is well known in Aberdeen for setting up the Aberdeen Kendo Club a number of years ago, has invited Ronnie and his wife Gail to accompany him on a tour of Japan. The highlight of the tour for Ronnie will be visiting the Karate Dojo’s where they have organised displays of three of the traditional Japanese karate styles. They will also visit Nagasaki where they have been invited by Tomishisa Taue, the Mayor of Nagasaki and some of the most prominent Karate Masters in their area to attend a dinner in his honour. Ronnie is no stranger to Japan having visited six times to date and training in the world famous Takushoku Dojo, where modern Shotokan Karate was brought to the world by the Japan Karate Association. Ronnie’s connections with Japan go back a long way. When he started Karate 50 years ago, after being inspired by James Bond movies, very little was known about Karate in Scotland. Few people knew anything other than simple basics and even that was of a questionable standard. The only way to learn was to go to Japan or attend some courses the Japanese masters were running down at Crystal Palace in London. Ronnie did both. After years of training with the visiting Japanese instructors and visiting the source of knowledge in Japan Ronnie became well known as an instructor and an international competitor. Leading the Scottish Karate team and Teaching over 20,000 people karate. In his Karate career Ronnie has brought many Japanese Instructors to the UK, Germany and Norway. He became good friends with many legendary karate masters such as Nakayama, Kase, Shirai, Enoeda and Ochi. Many would stay at his home in Aberdeen. Ronnie brought a team over from Japan to compete in a friendship tournament and in 2001 organised the WKC World Karate Championships at the Aberdeen Exhibition and conference centre. His work with the Japanese and the good work Ronnie has contributed to Karate, not only in the UK but in many countries he visits to teach Karate, has not gone unrecognised. Ronnie is one of the few people to be honoured by the Japanese outside of Japan, with an Order of the Rising Sun – an award not to be taken lightly. He has also since been recognised by the Queen with an OBE and named ‘Sports personality of the year’ by Aberdeen City Council. He also has honours from the government of Slovakia and from other Karate Clubs in Europe. Last year he was entered into the ‘European Hall of Fame for Martial Artists’. 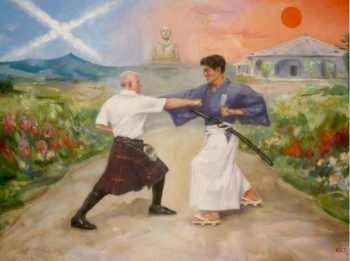 In 2015, in tribute to ‘Scottish Samurai’, Thomas Blake Glover, Ronnie helped to organise the hosting of 22 Japanese students and school children who were doing a pilgrimage visit from Kagoshima to Aberdeen and London. After his arrival in Japan, Glover had sent 22 students to be educated in the ‘modern world’ and is credited with modernising Japan. Glover is also credited with reviving The Order of the Rising Sun. During the student’s tour of Aberdeen and London, Aberdeen was very proud to be able to host every person with a family including Ronnie and some of his friends. Ronnie is looking forward to seeing some of Kagoshima on his visit. Ronnie was recently awarded his 9th Dan making him one of the highest graded Karateka in the world and one of the worlds most experienced. As if all this wasn’t already enough to keep him busy, 22 years ago Ronnie Founded a small awards event to help recognise and encourage people in different aspects of life. Initially it was centred round sports but now the Scottish Samurai Awards have grown into something really special. Each year they have grown into a more prestigious date in the Aberdeen social event calendar. Names like Alex Salmond, Sean Connery, Sir Ian Wood, Tommy Dreelan, Martin Gilbert, Dr Joseph Morrow (Lord Lyon of Scotland) and The Very Reverend Professor Ian Torrance, have added Kudos to the broad spectrum of recipients who are recognised for being ‘people of spirit’ – Scottish Samurai. Speyside farmers launch bid to produce beef to rival world famous Kobe beef from Japan. With thanks to Eoin Smith, Tricker PR. 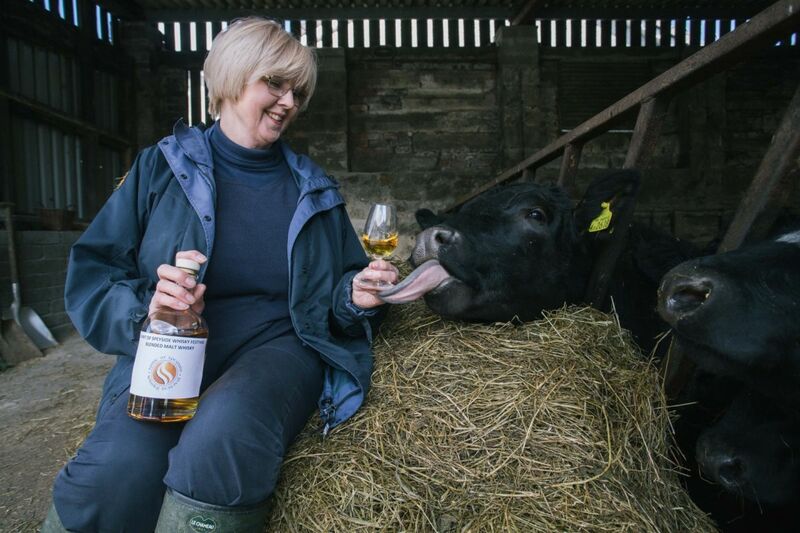 One of the Aberdeen Angus herd cannot wait to get his daily dram from Spirit of Speyside Whisky Festival director Ann Miller. Farmers on Speyside are being urged to lead a fight back for the Scotch whisky industry after a Japanese malt was named best in the world – by feeding their cattle a daily dram. A nip of our national drink – coupled with a diet of high quality feed from distillery by-products – could produce meat so succulent and tender that it will rival Japan’s famous Kobe beef. “We do not believe there is anywhere on earth that produces better malt whisky than Speyside – and millions of whisky drinkers agree. They were mucking out a byre one evening on their farm, Ure Gullybale, near the distillery town of Keith and poured a bottle of single malt Scotch into a water trough. “I’m a big fan of two of Speyside’s most famous products – malt whisky and traditional music – and so I decided to share these with our cattle. “With all this focus on Japan, I suppose we are a little worried that the thousands of visitors who fly in from all corners of the globe to enjoy our Festival might be tempted to go there instead. Photo: Caroline Marshall, winner of the 2015 Thomas Glover Scholarship. A prestigious annual scholarship which offers a student from a Scottish university the opportunity to visit Japan to study the country’s language, business and culture has attracted a record level of interest. Applications to the 2016 Thomas Blake Glover Aberdeen Asset Scholarship have eclipsed all previous entry levels. With 68 entries, it is double the number who applied last year and is the highest number of applications on record, according to the Japan Society of Scotland which runs the scholarship sponsored by Aberdeen Asset Management. The judging panel will have the tough task of drawing up a short list in the run up to Christmas, with interviews likely to take place in mid to late January. “At 68 the number of applicants this year has more than doubled compared with last and has risen steeply compared to previous years. The gender split is fairly even and there are applications from students attending a variety of Scottish universities. The Thomas Blake Glover Aberdeen Asset Scholarship is a charitable fund which enables young people with an interest in Japanese culture and a clear business focus the chance to apply. It funds travel to Japan for intensive study of the Japanese language at the International Christian University (ICU) Summer Programme, with preference to candidate whose interest in Japan has a business focus. This year’s winner, Caroline Marshall, spent the summer in Tokyo and described the experience as a dream come true. Caroline (21), a former pupil of Trinity High School and Stonelaw High School, both Rutherglen, Glasgow is studying law at the University of Edinburgh and wants to pursue a career in international commercial law. “I can’t imagine gaining this kind of experience anywhere else. “The programme is designed to teach a year of university level Japanese in six weeks. While this sounds daunting, it’s been an exciting and unique opportunity. Attending classes were only part of the experience. ICU runs a cultural programme alongside the course, meaning that students are given the opportunity to experience many traditional Japanese activities or places with Japanese students to guide us. The scholarship has grown in status and reputation over the years, evident by the rising tide of applications. Martin Gilbert, chief executive of Aberdeen Asset Management, said: “It is encouraging to see a marked increase in the number of applications for this scholarship which offers an exceptional opportunity to experience Japanese education, industries and lifestyle and an opportunity to forge new partnerships with the country, which has one of the world’s largest economies. Ronnie Watt’s National Karate Federation have returned from Berk, France where an international open competition was held on the 25th of October 2015. 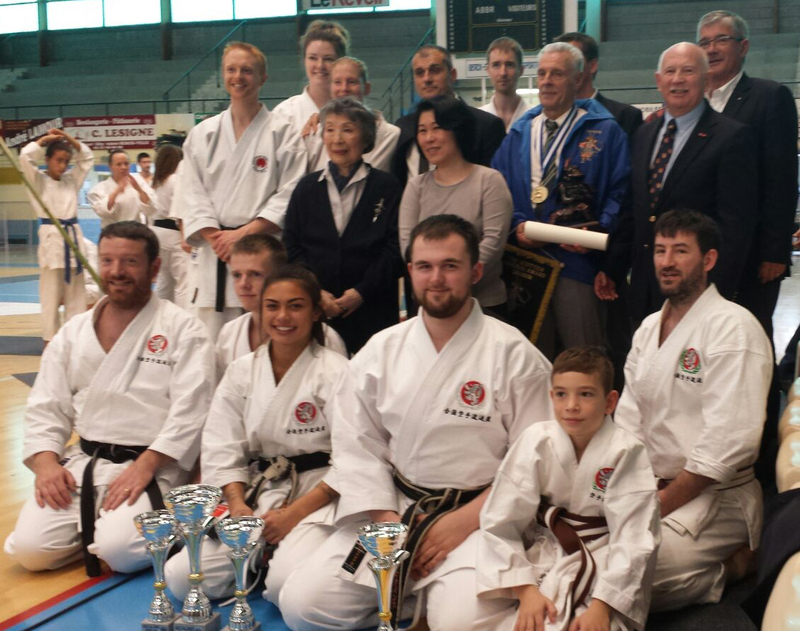 The competition was hosted by French instructor Alain Verbeek (6th Dan). Alain’s club trains in the doctrines of Alain’s late instructor, Taiji Kase (9th Dan). Kase is a widely respected Japanese Karate legend. Our Aberdeen based NKF team did exceptionally well during the competition returning with 4 international medals against some stiff competition which included 1 Gold and 3 Silver – Nissara Kirk taking the Gold and 2 Bronze, and John McInnes taking a Silver. There were 150 competitors in all so Ronnie and his squad can hold their heads high. A special training course was held the day before the competition. Participants in the course enjoyed 6 hours of karate training the day before the competition from 4 different karate masters. Participants travelled from around Europe to reach Berck for this rare opportunity with competitors from Germany, Austria, Scotland, France and many from Brittany. Shihan Ronnie Watt (8th Dan) from Aberdeen focused on speed technique to score points in kumite. Sensei Alain Verbeek (6th dan) demonstrated Kase-ha sparring tactics, using various knife hand attacks in response to an attacker. Sensei Christian Le Romancer (Brittany) demonstrated bunkai and emphasised the importance of Kime (power, focus). Sensei Dieter Langer (3rd Dan) from Germany demonstrated the structures behind the kata and the importance of form over strength. Also present was the wife and daughter of Taiji Kase. They will soon publish a much anticipated book detailing the life and legend that was Taiji Kase. Kase was also a frequent visitor to Aberdeen and a close friend of Ronnie Watt. Alain Verbeek has studied Karate for over 45 years and in this time Ronnie and Alain have become great friends. At the end of the festival and competition Alain was surprised to receive a Samurai SHOGUN award for his service to karate and promotion of friendship between Scotland and France. The award was given after the closing ceremony of the competition in front of many guests and VIP’s including Chieko Kase (wife) and Sachiko Kase (daughter), the Mayor of Berk and the ambassador of Japan in France, Yoichi Suzuki. The Auld Alliance is still strong. The NKF would like to thank the French families that hosted the NKF squad and for showing them such great hospitality. After the tournament Ronnie and his NKF squad were invited to the Berck town hall to be treated to a special civic reception hosted by the Mayor of Berck, a senior MP and other VIPs from the area. Ronnie was presented with a medal by the Mayor of Berk for promoting friendship and culture between France and Scotland through Karate. Ronnie was also presented with a very special gift, from the people of Inverness, France. 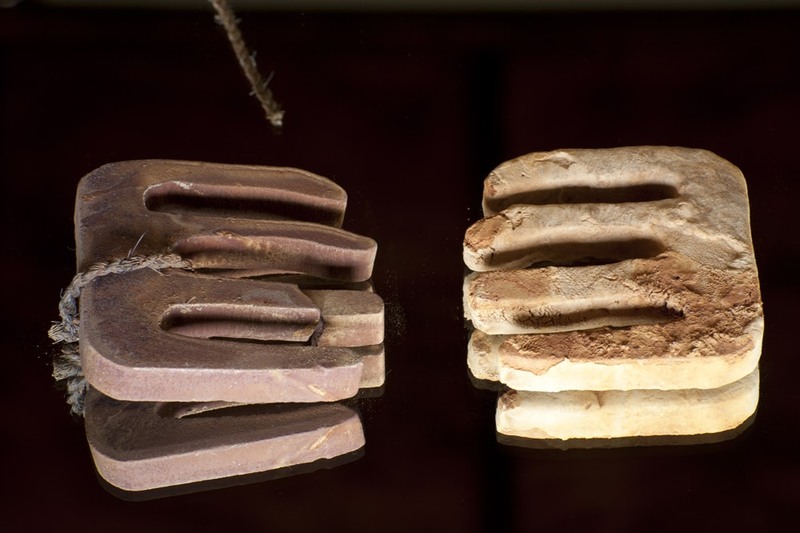 This was an unexploded world war one shell (pictured right), encased in a special hand made box. 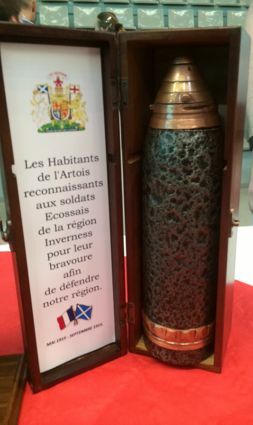 It had been fired into the area where the Scottish soldiers had fought, many giving their lives to fight for the freedom of France in the Great War, 1915. Ronnie said he was “deeply moved” by this special gift. 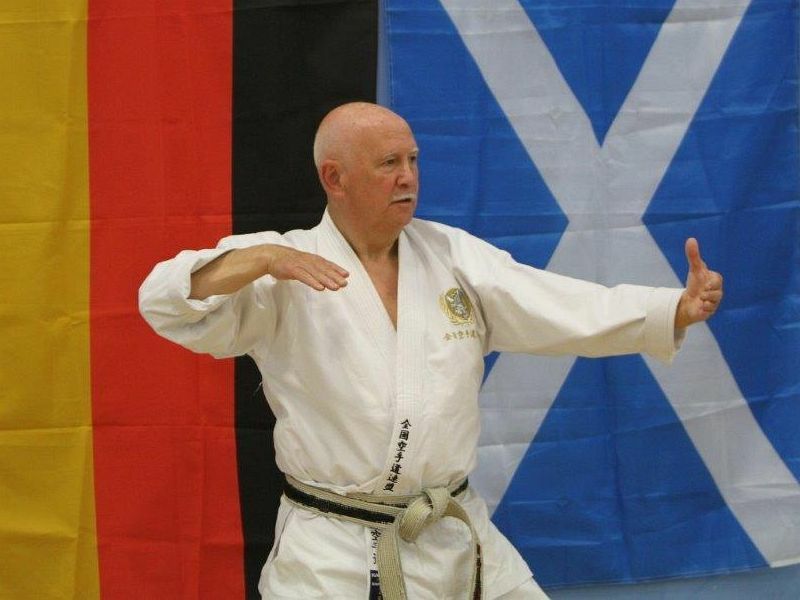 If you think about karate or martial arts in Aberdeen, or even in Scotland or in the UK, one name that will spring to mind should be our very own Ronnie Watt (8th Dan, OBE, ORS) who this year celebrates training in Karate for 50 years. Ronnie has never been out of the headlines and this month is no different, as it has just been announced that Ronnie is to receive yet another significant award in recognition of his karate, this time from an international organisation. Charlie Abel reports. The President of the IBSSA (International Bodyguard and Security Services Association) has acknowledged Ronnie by entering him into the European Hall of Fame for Martial Arts. The honorary award ceremony will take place in Rheine, Germany at their black tie Gala where Ronnie will attend as their special guest. Ronnie is delighted to receive the award, which came as a great surprise, and is another very prestigious occasion for Ronnie and his family. It also brings Aberdeen to the forefront of International Karate, the city again recognised on the international stage as having a living legend in our midst. In recognition of his services to karate, Ronnie has previously been honoured by the Emperor of Japan with the Order of the Rising Sun and has been appointed an OBE from her majesty the Queen. Ronnie has now been inducted in to the European Martial Arts Hall of Fame 2015. After 50 years of training karate, competing and winning medals around the world, not to mention teaching tens of thousands of children and adults, many students reaching black belt and going on to win medals in various world championship karate events, Ronnie’s place in history is already clearly stamped, though there’s still plenty ink left! Ronnie continues to train and still teaches to his private members in Aberdeen three times a week and is constantly receiving invitations to travel abroad to train at karate festivals and self defence courses. 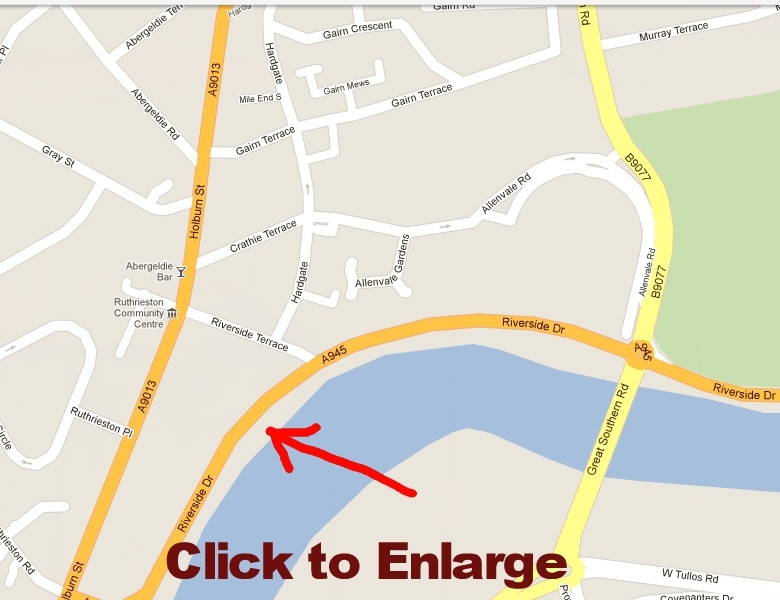 Anyone in Aberdeen of any age (over 5) interested in becoming a member of Ronnie Watt’s Karate Academy should call 01224 734607 or visit www.karate-scotland.info. If you are interested in self defence, getting into better shape and keeping fit while learning an ancient Japanese discipline, this is an ideal opportunity to train with a real master of karate….here in Aberdeen! What are you waiting for? It just doesn’t get any better! 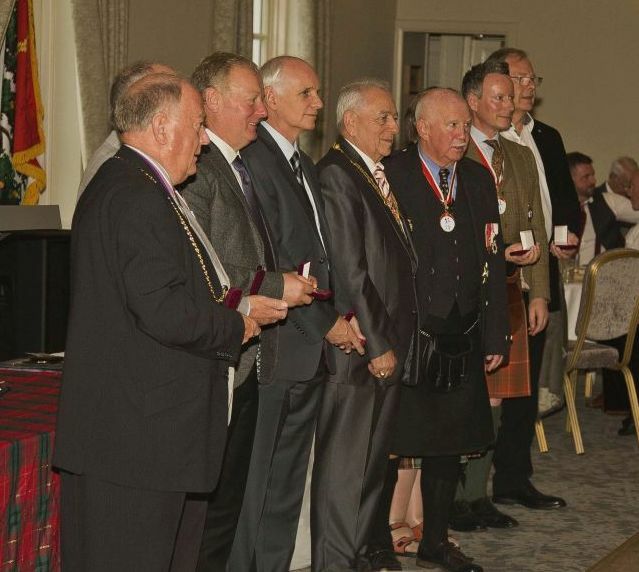 Aberdeen City Council treated the 2015 Scottish Samurai awards to a special civic reception at the town house on the 20th of July 2015. The Lord Provost, George Adam, welcomed distinguished guests and opened the awards with a very well received welcome speech. First to collect an award was Benedict Bruce, the youngest of this years recipients was awarded the Scottish Samurai – Order of merit and was also presented with his WKC Shodan certificate by Dr. Fritz Wendland, the President of the world karate confederation who travelled from Germany. 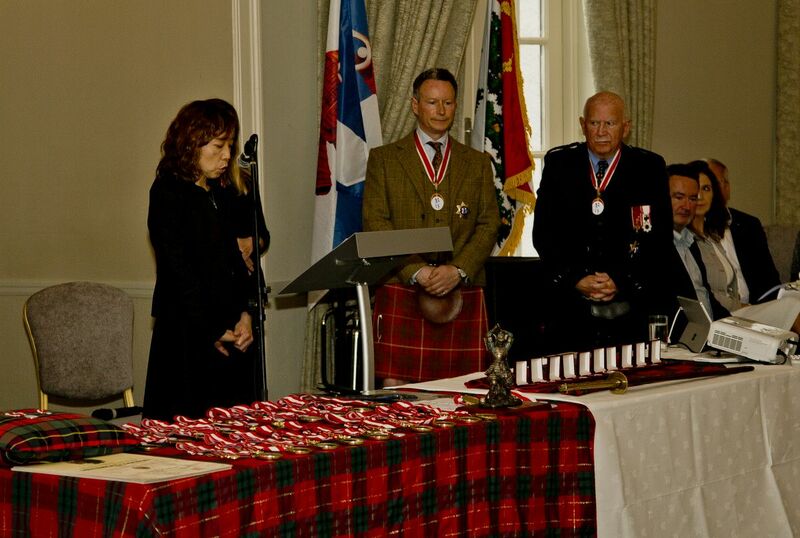 Mr Hajime Kitaoka, the Consul General of Japan in Edinburgh was awarded the Scottish Shogun Commander for his work in promoting friendship between Japan and Scotland. Mrs. Kitaoka was also given a special presentation for her part in helping his work. 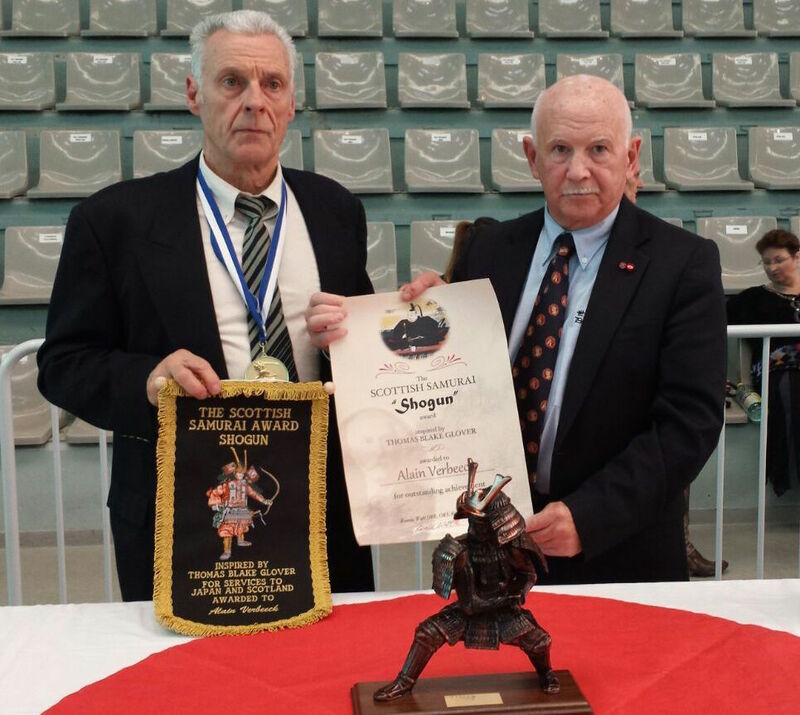 Ian Kirk, a well-known business figure in the Aberdeen Oil Industry was awarded The Scottish Samurai award for forty years of training in a Japanese martial discipline (Karate). Bill Berry MBE, a very well respected Judo master (7th Dan Judo) presented Ian with the award. Bill Berry himself was also promoted to Shogun. As was a previous Samurai winner Mike Mitchell, star of the silver screen and five times world body building champion. Two world-renowned sculptors, Hironori Katagiri and Kate Thomson were awarded the Scottish Samurai Award for their contribution to fine art. 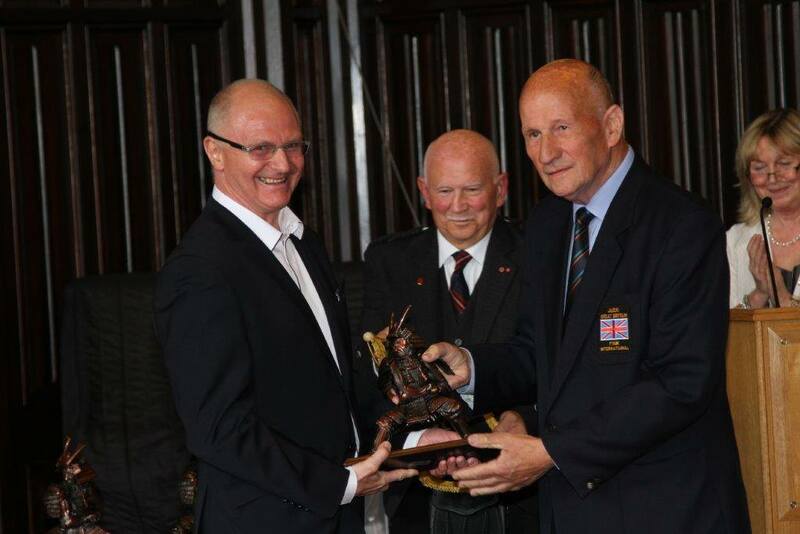 The Lord Provost, George Adam collected an award on behalf of Aberdeen City Council for their part in helping with the hosting of the 2015 Samurai Awards and for Aberdeen, being the spiritual home of the Scottish Samurai. The ceremony concluded with a thank you speech from the founder and president of the awards, Ronnie Watt OBE ORS (8th Dan) who celebrates 50 years of Karate in 2015 and also 20 years of running the Scottish Samurai awards. With thanks to Esther Green. A student has won a prestigious scholarship to visit Japan to study language and culture, following in the footsteps of the Aberdeenshire-born entrepreneur Thomas Glover. As the winner of the 2015 Thomas Blake Glover Aberdeen Asset Scholarship, Caroline Marshall (20) has been awarded a six-week fully-funded intensive language study course at the International Christian University, Tokyo. 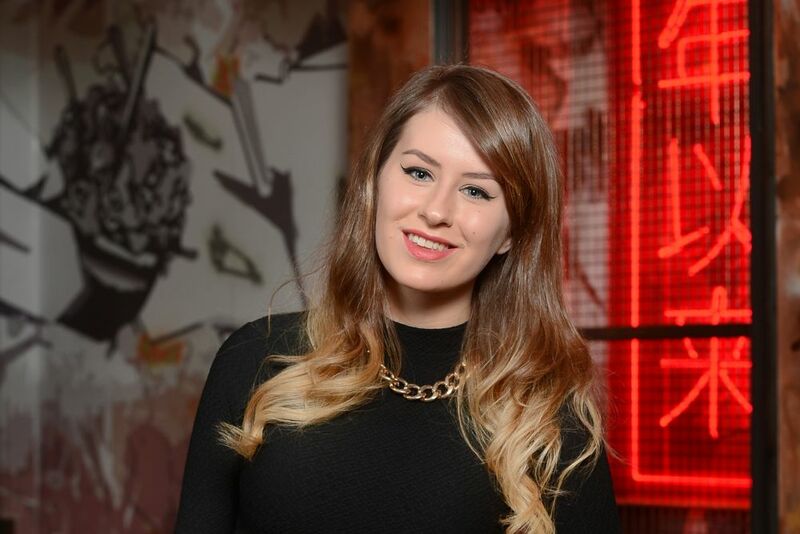 A former pupil of Trinity High School and Stonelaw High School, both Rutherglen, Glasgow, Caroline is in her third year studying law at the University of Edinburgh and hopes to pursue a career in international commercial law. She has a long-established love of the Japanese tradition of the Takarazuka Forum Theatre, a distinguished all-female acting school. This spawned her interest and admiration in the wider Japanese culture and way of life. She attends Japanese classes and when she learned about the Thomas Glover Scholarship last year, she felt it would provide a fantastic chance to visit, and learn more about, a country that inspires her. “I feel really honoured to be afforded this amazing opportunity as I have been passionate about Japan for a number of years but I have never had the opportunity to go there. The annual scholarship was initiated by the Japan Society of Scotland and is sponsored by Aberdeen Asset Management. It is open to students from all over Scotland with an interest in business and Japan, with six candidates making it through to final interviews at the Japanese Consulate-General in Edinburgh last month. The scholarship is named after the Scottish entrepreneur Thomas Blake Glover who was born in Aberdeenshire in 1838. Glover settled in Nagasaki in 1859 and played a critically important role in opening Japan to the west. Known as the Scottish Samurai, he introduced the first railway locomotive, started the Kirin brewery and influenced the industrial development of Mitsubishi. The scholarship aims to recognise these successes by providing young Scots with the opportunity to learn about business and culture in the hope of further improving Scotland’s historic links with Japan. Aberdeen Asset Management has been investing in Japan since the 1980s, opening an office in Tokyo in 2006. “We are proud to support initiatives which give committed and enthusiastic Scots an opportunity to advance their career opportunities and with a such keen interest in Japan, both culturally and commercially, Caroline was a clear winner. With Thanks to Jonathan Russell and Aberdeen CND. 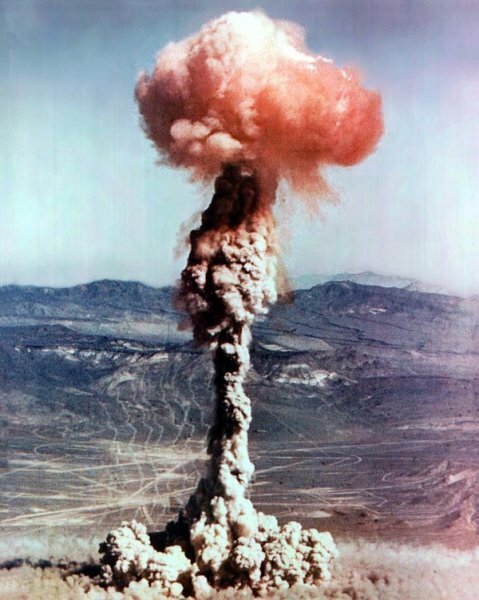 Tuesday 6th August sees the 68th anniversary of the first ever explosion of a nuclear weapon when the United States dropped a nuclear bomb on the Japanese city of Hiroshima. This was followed on the 9th August by the explosion of a further nuclear bomb on the Japanese city of Nagasaki. Aberdeen and District Campaign for Nuclear Disarmament have organised an event to mark the occasion and remind people of the potential horror of the use of nuclear weapons. 200 peace lanterns will be released onto the river Dee to commemorate the 200,000 men, women and children who died following the nuclear explosions at Hiroshima and Nagasaki. Many more died later from injuries or prematurely from the horrendous health effects that followed. Poems will be read by Tommy Campbell from Unite and Aberdeen Trades Council. Kirsty Potts will provide some rousing songs. “For most of us nuclear weapons have been a part of the world we live in for all of our lives. We can as such often put into the back of our minds just how horrific these weapons would be if used. As part of the Nuclear Non Proliferation Treaty and the New Start treaty of December 2010 nearly 50% of these monstrous weapons have been destroyed.